The self-proclaimed free town of Christiania is one of most popular spots in Copenhagen. Established in 1971 at Bådmandsgade, Christiania is a large commune with special status, famous for its free cannabis trade. Stop by to explore the picturesque city-within-a-city and discover these 10 great restaurants. Morgenstedet is a long-standing restaurant, known for its vegetarian food. The restaurant opened 20 years ago in a small cottage, where it is still located. The highlight of the place is its picturesque cobbled courtyard, with benches to sit on in the sunlight. All dishes are prepared with fresh and organic vegetables, grown locally. Despite its name, which means ‘the morning place’, Morgenstedet opens at noon. One of Christiania’s most beloved restaurants is Spiseloppen, known for its distinctive location and daily changing delicious food. Housed inside an old military warehouse from the 19th century, Spiseloppen is located right above Christiania’s concert hall. The menu reflects the international background of Spiseloppen’s chefs and waiters, who come from 16 countries. Stop by and be awed by creative and diverse meals based on Indian, Danish and French cuisine. Nemoland started as a fruit and vegetable store, but quickly diversified into a café, beer garden and a concert stage as its popularity grew. Nemoland serves simple and tasty food, ranging from weekly specials to a la carte dishes. During the day they serve burgers, sandwiches and other snack food, while dinner options include pastas, steaks and salads. During the summer months, Nemoland opens its hugely popular outdoor beer garden. Check out their calendar for upcoming events, as Nemoland is known for throwing free Sunday concerts. A charming Christiania landmark, Grønsagen combines a restaurant with a store selling fresh produce. Browse through the buffet food to find your meal and sit down among the shelves, which are laden with fruits and vegetables from local farmers. Despite its name, the buffet food is not all vegetables, but includes meatballs, hummus, lasagnas and salads. If you’re lucky, you will find some local specialties as well. You can mix and match your food and pay by the weight. Located on the infamous Pusher Street in Christiania, Woodstock is the oldest café and bar in the area. Known for cheap beer and a laid back atmosphere, this cafe is full of the old spirit of Christiania and serves breakfast in the morning, and classic Danish open sandwiches for lunch. Try the special house smørrebrod, made with buttered rye bread topped with rolled pork, onion and jellied stock. Enjoy the afternoon sun with a warm cup of coffee or tea and switch to Christiania’s best beer later in the evening. 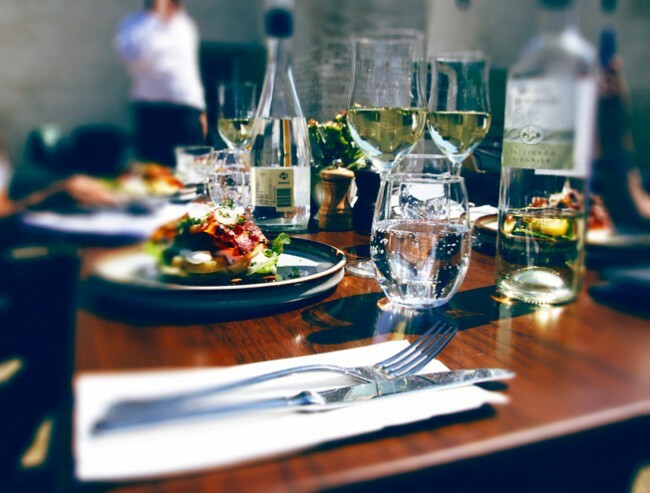 Located in an old mill dating back to 1669, Bastionen + Løven is a classy, canal-side restaurant. The elegant interior combines tables covered in crisp white tablecloths, dark furniture and soft candlelight to create an elegant environment. Besides the indoor area, the restaurant has a garden seating space located in an idyllic courtyard. Bastionen + Løven serves traditional Danish specialties prepared with a modern twist. Try the beef tenderloin in red wine sauce, served with potatoes and vegetables. Relaxed atmosphere, delicious Italian food and wooden interior and all signature marks of L’Altro. A popular restaurant for locals and Italian expats, it serves simple dishes from central Italy. The menu changes seasonally to reflect available ingredients. Enjoy fine-dining delicacies that can range from tuna mousse to pumpkin pasta and veal with cabbage, marinated in balsamico vinegar. Månefiskeren, meaning moonfisher, is one of Christiania’s most popular cafés known for hosting concerts and other cultural events. Situated in an old factory with a big outdoor space, the café welcomes both local crowds and wandering tourists. Stop by for morning brunch, with eggs and bacon followed by fresh coffee, or later in the afternoon for tasty sandwiches and sweet cakes. Restaurant 56° is a charming Nordic restaurant, located in the old naval dockyard at Holmen. Focusing on traditional specialties from the Nordic region, Restaurant 56° is known for quality food and welcoming atmosphere. The interior is rustic, combining dark and light tones; white walls and white wooden window shutters against a wooden floor, wooden beam ceiling and dark furniture. The dinner menu is a la carte, with two tasting menus available. The seasonal menu includes three courses, while the 56° menu has four courses. Even though Sunshine Bakery is not a typical restaurant, it is one of symbols of Christiania. Opened in the 1970s, the bakery has been going ever since, with a 24-hour work schedule. Sunshine Bakery sells traditional Danish pastries, bread, sandwiches, coffee, tea and soft drinks. The pastries range from local favorites cinnamon rolls to rum balls, made from leftover pastries, jam, cocoa and rum. Don’t miss out on trying drømmekage, a dream cake combining sponge cake with coconut and caramel topping.